Cannabis enjoys a nebulous legal status right now in the United States. It is classified a Schedule I drug by the federal government, meaning it has no medical or productive use whatsoever. This seems to fly in the face of reality and the many established medical uses of the product. About half the states have legalized some form of cannabis use at this point with more seeming to happen every year. This obviously puts the states at odds with the federal government, which has the potential to lead to problems. In addition, each state has different rules and regulations regarding the growth, store, transportation, exchange and sale of the cannabis products. While I personally have no interest in the recreational use of cannabis, I have seen near miracles in the medical use with friends and family – from creams for arthritic conditions to CBD pills for sleep disorders, to helping with chemotherapy side effects from cancer treatment. I’m one of a large number of people that would like to see serious medical research opened up with regard to cannabis, but in the meantime, people are working with what is available. I spoke with Paragon CTO Vadym Kurylovich and CSO Chuck Bogorad for some insight. 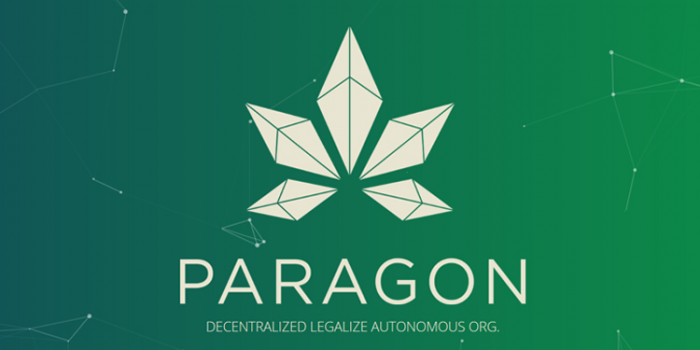 Let’s take a look at what Paragon plans to do to modernize the exploding cannabis industry. The first part, as illustrated above, is to connect a consumer with a supplier through proper channels. Using a blockchain ledger ensures that each step of the process is accomplished before the next step can happen. This includes the supply chain for the product, from growing to processing to testing and eventually to the dispensary where it is connected to the consumer who has gone through their own process. Some examples of the smart contract uses in the cannabis industry include verification of medical marijuana IDs and prescriptions. Track cannabis products through the supply chain and ensure that expiration dates are honored, for example. Link physical goods to serial numbers, barcodes, RFID, etc. In connection with their PRG cryptocurrency, you are able to solve much of the impediment to cannabis innovation and growth – the banking, payment and visibility for regulation issues. After the PRG token gets rolling, the plans for Paragon get really big with their ParagonSpace. The concept is to set up physical centers similar to WeWork where cannabis is legal and there is a strong interest in the product. This will give startups easy access to a network of resources to set up, manage and grow their business with the help of like-minded individuals. They have a lot of interesting concepts around this in their white paper, and from their timeline, it looks like the first ones will be near me here in California. Finally, they have their ParagonOnline concept since not everyone can physically get together in a ParagonSpace. This is designed as a “community-based” online space where tasks, functions, goals and priorities are defined and worked on in real time by the community. The structure of the Paragon platform will encourage individuals to take long-term interest in a project or speculate on a number of ideas. This is an interesting space with a lot of money involved and global implications. It is also ripe with opportunity to ensure regulatory compliance, safe products and guarantee of funds. Paragon is in the process of the pre-sale of their PRG token right now until September 15 at which time the open crowdsale will start. The pre-sale has so far raised over $25 million in two weeks. Their upcoming token crowdsale will run from September 15 to October 15 UTC with a maximum number of 100,000,000 of the PRG token to be sold. The company will post clear instructions on how to acquire their PRG token before crowdsale. Read more from this Blockchain Spotlight series.